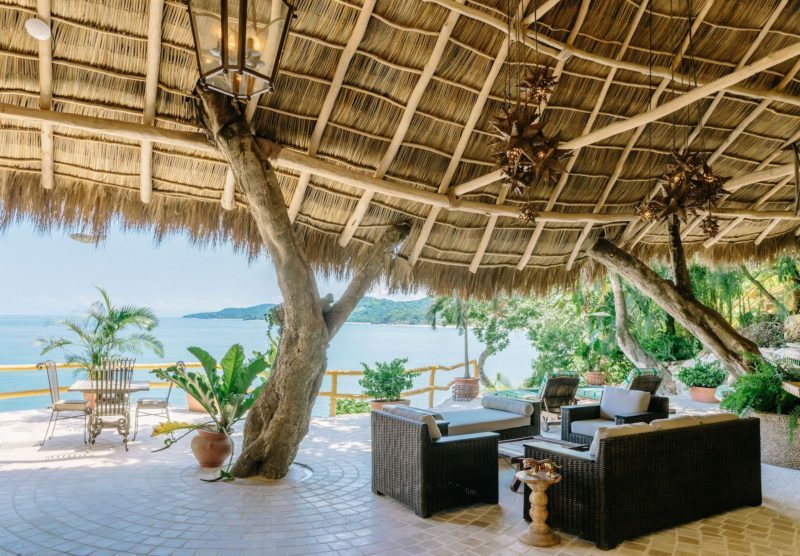 If Hansel and Gretel had a beachfront house, it would be the Amor Boutique Hotel in the coastal pueblo of Sayulita, Mexico. We visited Mexico many times on family vacations and had never found anything resembling any fairytales, but, during our last trip to Sayulita, we happily stepped into the pages of Once Upon A Time. Staircases, winding through jungle hills, on which the hotel rests, lead to rooms guarded by carved wooden doors that surely must have barred a few wicked witches in their long history. Maybe even a dragon or two. Instead of slick credit card portals, each door is padlocked and opened by a creaking skeleton key. Inside Villa Arboles, a wooden loveseat, attached by chains to beams running along the ceiling of our outdoor living room, squeaked soundly as our two boys swung. They gazed without a sound, for a change, at beached fishing boats and surfers wading through the patchwork quilt of jade and turquoise ocean below. There is no celebrity architect attached to this mystical hotel, only a wise California surfer, Rod Ingram, who saw in the 1970s the potential in this enchanted cove. He dreamed of catching waves with his family and helping the surrounding community prosper by employing them to build what started as his private residence, which he conjured into the Amor Boutique Hotel. Today, visitors can rent one of the 30 individual “rooms” that sprang from his original abode. Our three-bedroom wing consisted of three private bungalows, connected by an outdoor living room, each with its own bathroom, fit for a Roman king or queen, decorated by frescos and statues. An outdoor kitchen overlooked a private pool facing the ocean. But, unless you want to be visited by forest friends, be sure to put away all food. Guests will appreciate the unique decorations around the hotel and in every living space, created by Mexico’s Master Artists. Each room also features a collection of artisan furniture gathered through Ingram’s voyages to Thailand, Istanbul, Morocco and India. To conveniently fuel our epic journeys, the on-site O Restaurant, set around a tree with mighty branches shielding diners below, provided fresh seafood on a little cliff overlooking a vast ocean. Lanterns and lights, strung overhead, illuminated dinner or drinks once the sun set sail to far-off lands. Explorers are invited to rest after their travels in a secret garden spa where potions incorporate indigenous seeds and foliage to create a dreamy, restorative experience. 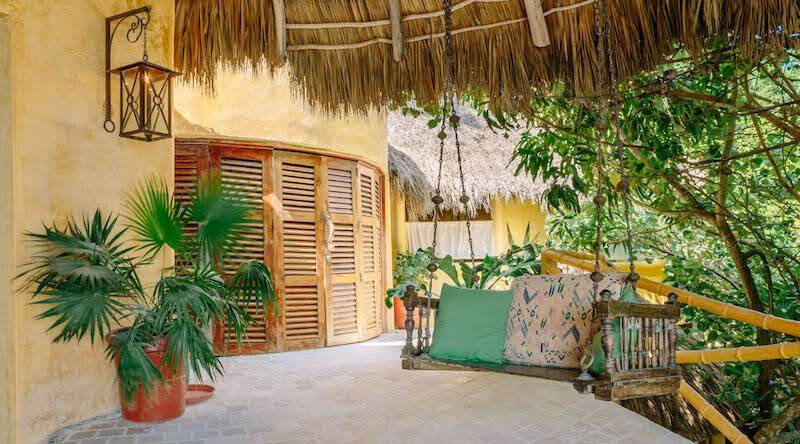 We started each morning, not far from this garden, with yoga, in a covered palapa, steps from a pool which stretched into infinity. Sylvie studied in Costa Rica the ancient art of healing and shared her revelations with us. 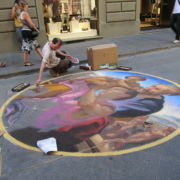 The creative routines centered our spirits and prepared us for all possible encounters. Although the hotel concierge could have manifested all our adventures, we decided to journey on our own. It was while we ventured through the beach below our hotel that we met a motley of fishermen by a beached 24-foot Panga called La Joya de Sayulita. The brave captain, tall, skinny, in his mid-30s with baggy board shorts and a straw lifeguard hat, Joshue, nicknamed Solin, offered a day’s passage for $200. This was a savings over the price offered by the hotel concierge. Our quest included fishing gear and the live bait, which Captain Solin’s crew of two kindly attached to our hooks. 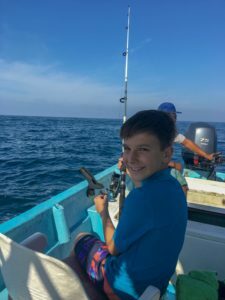 The son of Captain Solin, Pancho, with twinkling eyes and a crooked smile, also about the age of my boys, joined us as we surveyed the sea and discovered the life within. Pancho filled my sons’ heads with glorious stories of the land where he lives and the video games he played. They commiserated over their shared fate of procuring homework for their evil school teachers. Another day, we set off down a sun-faded, pink-and-red cobblestone path to explore the village of Sayulita. It was about a 10-minute stroll from our seaside hotel. Red, yellow and blue flags still flapped overhead in festive horizontal lines, brightly marking the celebration of Dia de la Muerte. As the holiday was months past, they may have become a permanent fixture that matched the canary, crimson and cobalt houses. We walked by storefronts filled with grand tapestries, skeleton pottery and turquoise jewelry. Swaying palm trees called families to gather in the town plaza. 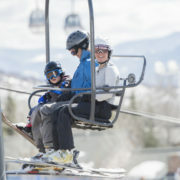 On holidays and monumental family events, the plaza fills with dancing and music. On this day, pockets of men stood talking in collared shirts and cowboy hats, while children ran around with balls and women sat on low walls around manicured lawns. 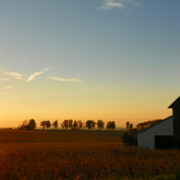 Stray dogs bounced along, tails wagging, tongues hanging, as they combed through piles of forgotten food. Their happiness made us smile. 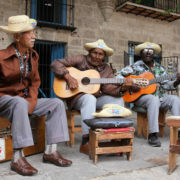 Along one of the two main streets, Calle Revolucion, spices mingled with sounds of sizzling meat and cast their tempting tendrils around us as we walked by the many outdoor restaurants. The sidewalk and street were a mosaic of chairs and tables, leaving a thin line for cars to pass. We chose the Sayulita Cafe, where servers brought freshly mixed salsas in ceramic bowls. We ordered fish tacos and I could have sworn fishermen pulled their catch out of the water minutes before. Never have I tasted such fresh and finely prepared fish tacos. I could have eaten every meal at this roadside restaurant. 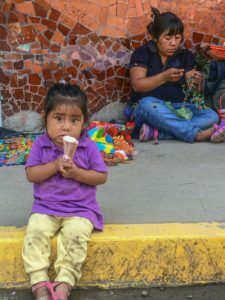 We wanted to explore some of the famed galleries and artwork of the Huichol Indians, an indigenous tribe still living without electricity or running water in the Sierra Madre Mountains, so we bribed the boys with chocolate-covered bananas from ChocoBanana. I was super impressed with the environmentally friendly packaging and the smokey, organic coffee. We walked by many galleries that displayed Huichol Indian art, but the epicenter of the craftsmanship is at the Huichol Center in the Galleria Tanana. 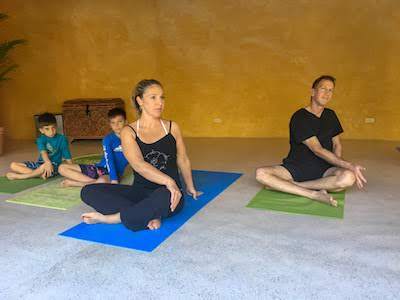 The owner, Susana Valadez, previously an archeologist, lived among the Huichol people, fell in love with and married a Huichol artist, Mariano. Their daughter, Angelica, helps run the gallery and their son, Cilau, is the artist in residence. 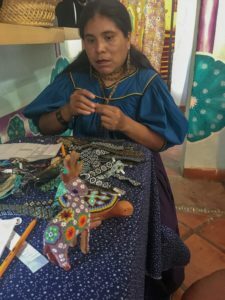 Susana dedicated her life to preserving the traditional Huichol way of life, at the same time protecting them from emerging environmental hazards by helping them fund their lifestyle by selling their artwork. “They don’t want anyone’s charity,” said Santos, a volunteer at the gallery. All proceeds from the sales in the gallery go back to the tribe. Next door, Blue Corn Mama is also part of the fundraising campaign. Even though we were still stuffed from our fish tacos, we decided to help out by eating the rich tamales and buying their beaded souvenirs. After all, there’s no better way to have a happily ever after than by helping others achieve theirs. 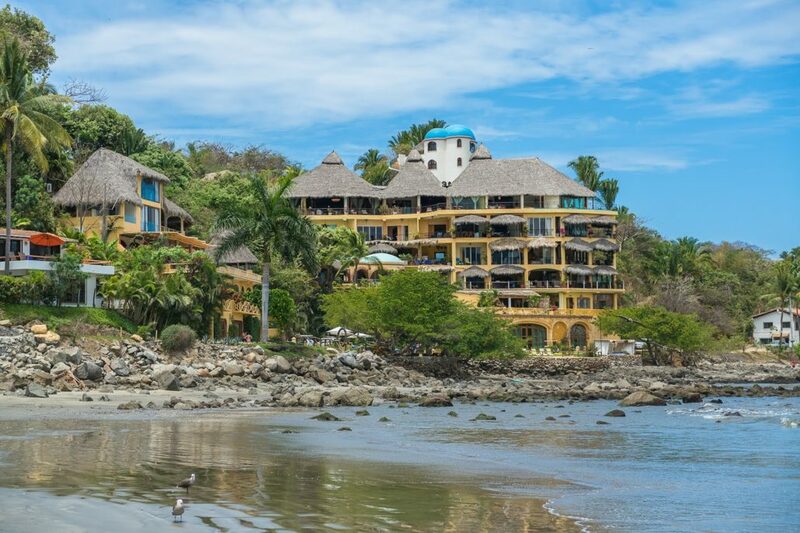 Sayulita is a 45-minute drive from Puerto Vallarta. Rates at the Amor Boutique Hotel vary with seasons but can range from $66.50 per night for studios to $1,456.00 for the seven-bedroom villa. Fishing boats and activities are priced by the vendors.